Open all year, Hotel delle Nazioni, 3 stars of Cesenatico, has a wellness center, parking, WI-FI connection. Small pets are allowed. 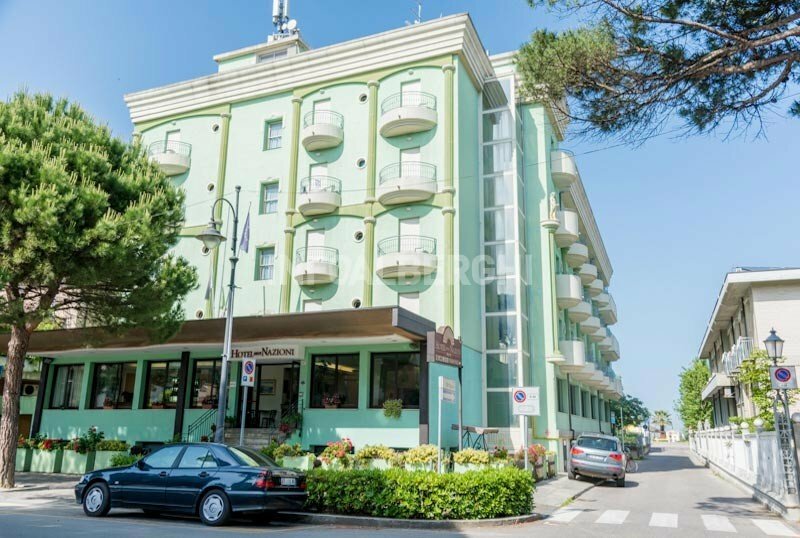 Hotel delle Nazioni is located in via Carducci, a few steps from the beach and the seafront of Cesenatico, in a central position even compared to the skyscraper and the canal harbor, places of tourist interest. The rooms have a balcony (also with side sea view), air conditioning, WI-FI, satellite LCD TV, safe, telephone and private bathroom with shower and hairdryer. Wellness center with mini hydromassage pool, sauna, emotional showers, turkish bath. It also features a lobby with TV, two lifts, one of which is panoramic, bar, free use of bicycles. Theme nights are organized. PARKING: uncovered, free, subject to availability. CONVENTIONS: private beach, amusement parks, swimming pool, waterslide, INAIL / INPS, law enforcement, organized excursions. LUNCH AND DINNER: menu with 3 or more choices, buffet of appetizers, vegetables and homemade desserts, drinks included 24 hours a day (water, orange juice, coca-cola and tea). In hotel: outdoor playground area, courtesy strollers (not bookable), entertainment, baby / mini / junior club. At meals: baby menu, baby food, baby seats at the table, kitchenette for mom, bottle warmer, afternoon snack. 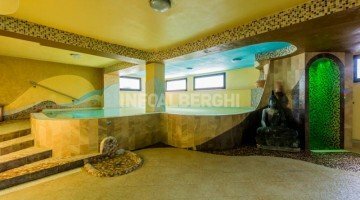 Wellness center, 120 square meters with a path with emotional showers, swimming pool with Jacuzzi, sauna, turkish bath, relaxation area. Free for all guests. The hotel has an agreement with the private beach "Bagno Ferrara" with entertainment, children's playground area, bar, bocce courts and beach volleyball. Weekly prices valid by booking by April 30, 2019. Weekly Package Prices in Formula Beach are per person, valid in family rooms by booking by April 30, 2019. CITY TAX: price list not included. Throughout the summer of 2018, 1 or 2 children stay free! Hotel delle Nazioni, in the center of Cesenatico, is open all year round and awaits you with unmissable offers for the winter and spring weekends and bridges! We await you with our formulas in Bed and Breakfast only or in Half Board and Full Board. All our formulas include: full-time soft drinks, use of the Wellness area with whirlpool, sauna, emotional showers and Turkish baths. Ask us for a quote without obligation! Summer 2019: prices locked in 2018! Plus, get a 3% extra discount on your total stay! All in All Inclusive Formula! In June we are waiting for you in Cesenatico to spend a real All Inclusive holiday! In a room with two adults, up to 2 children stay for free! Plus, get a 3% discount on your total stay! For you: full board, drinks with meals, full time soft drinks, beach, entertainment, wellness center, parking, bicycles, Family Top services. In July we are waiting for you in Cesenatico to spend a real All Inclusive holiday! In room with two adults, 1 or 2 children stay free! In August we are waiting for you in Cesenatico to spend a real All Inclusive holiday!